Documentation for the eGenix pyOpenSSL Distribution. In previous releases, we also added the OpenSSL version number to the package version. Since creates very long version numbers, we have dropped the OpenSSL version starting with 0.13.5 and will now increase the main version number with every release. In the future, we plan to switch to a new version scheme that is compatible with our normal version number scheme for products. Unfortunately, the OpenSSL documentation is not very complete. Most parts of the OpenSSL API are documented in form of man pages. The SSL API is documented in ssh (3) and the referenced man pages. The crypto API, which is not exposed by pyOpenSSL but includes useful information regarding available hashes and ciphers, is documented in crypto (3). 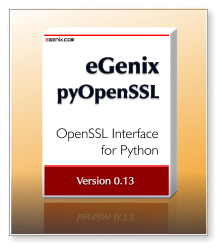 The openssl command line interface is included with the eGenix pyOpenSSL Distribution. In the current release, there is no direct Python interface to the tool yet, but you can find it by looking up the OpenSSL/ package directory. When using this binary, please make sure to set up LD_LIBRARY_PATH to look in the OpenSSL/ package directory first, since the openssl binary would otherwise try to use the system libraries instead of the included ones. We have included a few useful additions in our eGenix pyOpenSSL Distribution. This sections documents these additions. You can find the sources for all these extras in the extras/ directory of the source distribution. The eGenix pyOpenSSL Distribution includes these certificate authority (CA) certificate bundles as CRT files. The files are created from the most recent certificate bundles distributed with the Mozilla Firefox browser (as available from the Mozilla Firefox browser code base). The distribution includes a helper module OpenSSL.ca_bundle to easily access these embedded CA certificate lists for verification purposes. The CA bundles are updated with each new release of the eGenix pyOpenSSL distribution, and we also make them available as separate download. The headers of the files include the exact date of the last update of the files. Bundle of all Mozilla list of certificates which are trusted for at least one purpose. Bundle of all Mozilla list of certificates which are trusted for code signing. Bundle of all Mozilla list of certificates which are trusted for email verification (S/MIME). Bundle of all Mozilla list of certificates which are trusted for server authentication (SSL). Explicitly untrusted certificates included in the Mozilla certificate list are not included in these bundles. Even though OpenSSL can handle trust parameters embedded into certificate, tests have shown that it does not actually take the trust values of the certificates into account during verification (at least not for OpenSSL 1.0.1e and earlier). Including untrusted certificates could therefore cause OpenSSL to trust these explicitly untrusted certificates. Certificate trusted for email verification (S/MIME). Certificate trusted for code signing. Certificate trusted for any of the above purposes. It must be trusted for at least one of the trusted purposes. Provides access to the data stored for each certificate in the CA bundle. Create a new CARootCertificate instance from the CA bundle data. See the attribute descriptions for details on the parameter meanings. Return the certificate as pyOpenSSL X509 object. Return the SHA1 fingerprint in the Python .hexdigest() format (two digit lower case hex numbers). Return the CA root certificate bundle as text. path defaults to the path returned by get_ca_bundle_path(purpose), if not given. purpose may be given to narrow down the trusted purpose. Possible values are the TRUST_* values defined at module scope. Default is TRUST_ANY. If TRUST_ANY is given, any certificate trusted for at least one purpose is included. Return the absolute file path to the CA root certificate bundle file. This can be passed to the pyOpenSSL Context method .load_verify_locations(pemfile, capath) as pemfile. Iterate over all certificates in the CA root certificate bundle and return them as CARootCertificate instances. bundle defaults to the included CA root certificate bundle, if not given. purpose has the same meaning as for get_ca_bundle(). It is only used if bundle is not given. Iterate over all certificates in the CA root certificate bundle and return them as x509 instances. This can be used to load trusted certificates into the pyOpenSSL Context certificate store and provides a way to load the certificates without going through the file system. The source distribution of the eGenix pyOpenSSL Distribution contains an example script which show how to use the ca_bundle module to setup server certificate validation: examples/https_client.py. The example script sets up a socket for SSL communication and then reads the first 500 bytes from the homepage of a server. With this SSL context, all connections using this context will verify the server (aka peer) certificates against the embedded TRUST_ANY CA bundle file. In order to run the example script, you need to provide a client-side certificate/key pair. The examples/ directory already contains a demo certificate/key pair called cert.pem and pkey.pem which you can use. The latest version of eGenix pyOpenSSL includes support for TLS 1.1 and 1.2. Since OpenSSL has a somewhat peculiar way of defining allowed protocols, we explain how to setup the SSL context to only use a specific set of protocols. OpenSSL supports using only a single protocol version by specifying the protocol method, or a range by specifying a a minimum protocol method and a set of exclusions as context options. This normally happens automatically, but there are a few things to consider on Linux and Mac OS X. # this should print something like "OpenSSL 1.0.1j 15 Oct 2014"
# this should print something like "0.13.6"
Another option is adding the OpenSSL package directory to the LD_LIBRARY_PATH environment variable, e.g. Using this method is necessary in case you are using a Python runtime binary that will load the SSL libraries before you import OpenSSL. Our eGenix PyRun is such a Python runtime binary. It has the standard library ssl module linked into the runtime itself and will thus load the libraries when starting the runtime process. Starting with version 0.13.5, eGenix pyOpenSSL will automatically check the loaded OpenSSL library versions and issue a Warning in case it finds a mismatch between the version embedded in the distribution and the one loaded by the OS into the process. You still have to make sure that the application has not loaded the Python ssl, hashlib or socket module (or other modules which link to the OpenSSL libraries) before loading the pyOpenSSL package. If pyOpenSSL loads the wrong OpenSSL libraries, you can try to copy the OpenSSL libraries included in .../site-packages/OpenSSL/ to the location of the Python executable. Starting with version 0.13.4.1.0.1.9, we are compiling pyOpenSSL with OPENSSL_LOAD_CONF enabled to have it try to automatically load the openssl.cnf file when loading the module. The openssl.cnf file can be used to configure defaults for several OpenSSL commands and also to enable engines which allow access to system and hardware based cryptography subsystems.